If you live in a small or dark house, lighten things up – invest in pine furniture. It can be difficult coping with small rooms – especially bedrooms that require big furniture like beds and wardrobes. The risk is the furniture will be out of balance with the room, making it look even smaller and darker. But there is a solution – pine furniture is light and stylish, so it won’t swallow all the light in the room. If you love the natural beauty of wood but don’t want the heavy veneer – pine furniture is perfect for you. White or cream furniture can look a little stark in some settings, but pine adds the warmth you want while still keeping your room bright. If you are desperate to lift a dark or oppressive room in your home, pine furniture can be used throughout for a consistent and light feel. Also consider keeping your colour scheme light and neutral using creams or pale pastels for example. You don’t have to banish heavy colours – in fact introducing vibrant colours with accessories such as throws and cushions is a great way to add flair to a light room. If it’s your bedroom that you’re trying to inject a little life into, as well as pine furniture, opt for bed linen and cushions that shimmers or has reflective qualities. Patterns on the wall or carpet can make a room feel even more closed and small. But a light, bright mural or one feature wall in a room can add attention and life without overpowering the room. As well as pine furniture, consider investing in glass furniture where appropriate – a glass coffee table for example – or a see through bed frame rather than a solid bed frame to help the light move more freely around a room. If you do want patterns or wallpaper in your living room for example, wallpaper with a white background will help keep the room light. Curtains add warmth and depth to a room but if your room is particularly small, consider investing in blinds that allow light through it. If you must have curtains, make sure they have holdbacks to keep them clear of the windows by day and allow as much natural light as possible into your home. 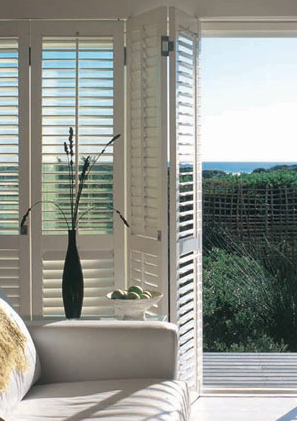 Or as an alternative to curtains consider plantation shutters to add some character to your windows.